Yes, I watched The Dukes of Hazzard on TV, every Friday night, religiously. I suppose I was more interested in the car jumps than in Daisy Duke, which probably makes me just a little younger than director Jay Chandrasekhar. In any case, Hollywood has gotten hold of my show and turned it into a big-screen affair. And while it wasn’t as good as I had hoped, it met my relatively low expectations. PG-13 for sexual content, crude & drug humor, language, etc. 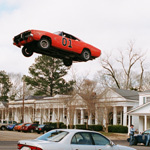 Set in the modern day, The Dukes of Hazzard features comic actor Seann William Scott (Dude, Where’s My Car) and Jackass alumnus Johnny Knoxville as Bo and Luke. Most of the characters from the TV show are also in the movie: singer Jessica Simpson makes her acting debut as Daisy, Willie Nelson plays Uncle Jesse, and Burt Reynolds takes over as Boss Hogg. The plot comes straight out of TV-land. Rosco P. Coltrane (M.C. Gainey) has planted an illegal still on the Duke farm, and now he will seize their land for the official investigation. Bo and Luke sneak out to see what’s really going and discover core samples in a safe at a construction site. They get the samples analyzed and discover that Boss Hogg plans to turn the Duke farm — and half of Hazzard County — into a coal mine. Unless, of course, the boys can stop him in time. Meanwhile, back at the ranch, Boss Hogg has used his cunning to trap Jesse and Daisy. He has them Hogg-tied as bait to lure the boys away from the courthouse, the one place Boss Hogg’s plans can be foiled. Will the boys fall into Boss Hogg’s trap? Will they be able to make it to the courthouse in time? How will they get past the roadblock? And how will Jessica Simpson and Willie Nelson wash away the bad taste of such a contrived ending? Tune in to find out. Shuck the plot. Nobody’s going to The Dukes of Hazzard for the plot. Some will go for Jessica Simpsons’ ten-inch shorts. Others will go for the car stunts. But the reason I went is because Jay Chandrasekhar directed. Some of the funniest gags are pure visual chaos. Bo and Luke practice archery by shooting flaming arrows at gas cans. They steal the safe that holds the core samples, and then try to break it open by dragging it behind Cooter’s tow truck. And of course all of the car jumps are ridiculously (and literally) over the top. But there’s also a brainy sort of humor with the Lizards. I’m not saying their humor is ever sophisticated, I’m just saying sometimes it requires a little gray matter. Like when Bo and Luke get badly caught on barbed wire, and then arrive unscathed in the next scene. What was a continuity error on the show has been lovingly preserved in the feature film as an homage to cheapness. This “brainy” — and I use the term loosely — style of humor really comes out in bringing the characters into the 21st century. When the boys head off to Atlanta they rev up the General and hightail it to the big city, where the first thing they encounter is... gridlock. Then they encounter progressive liberals who don’t appreciate their Confederate flag. Their wild car chase is humorlessly caught on tape by police helicopters. And so on. But humor is subjective, and my appetite for Broken Lizard doesn’t seem to be reflected in the main stream, which leaves me little room to recommend The Dukes of Hazzard. And so, for the third time, Movie Habit officially gives “thumbs down” to a Jay Chandrasekhar film.